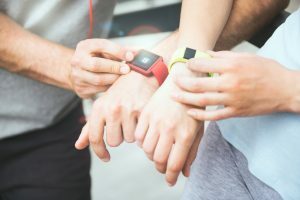 FitBit offers wireless-enabled, wearable activity trackers designed to help you become more active, eat a more well-rounded diet, sleep better and ultimately, make you healthier by measuring data such as the number of steps walked, heart rate, quality of sleep, steps climbed, and other personal metrics involved in fitness. The Fitbit lines includes options you can wear on your wrist or clip to your clothes. Some Fitbit models track your heart rate, while others offer fewer features but are more affordable. For more information, click here.